If you are out in the snow a lot and really using your gloves, digging, clearing trails, firewood…. good leather is the only thing that holds up. I have been using these gloves for close to 10 years and find them the most durable and well made gloves around. The leather is thick but supple and the fit is really excellent. They are quite warm, with a thick pile lining, ideal for a day out exploring on the Hoks. 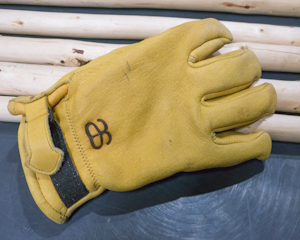 The gloves are made in Centralia WA by Churchill Glove Co. and are customized to our design. They are also branded with our AS logo. Available in XS – XL. On the size chart below, I would go a bit bigger as the lining takes up some space. 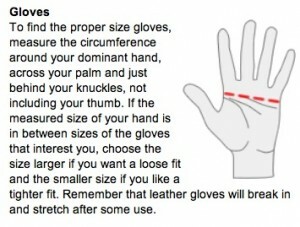 Tight gloves in cold weather will reduce circulation in your hands. Be the first to review “Lined Elkskin Leather Gloves” Click here to cancel reply.